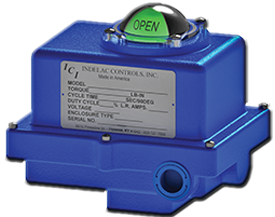 PosICIon+ Limit Switch VT56 & VT56-1 | Indelac Controls, Inc.
Indelac Controls, Inc. is proud to introduce the first model of our new posICIon+ series position transmitters and limit switch. ICI’s posICIon+ series, like all of our products, is 100% American made. The picture displays model VT56 which is designed to meet NEMA Type 4 and 4X as well as International Protection Code IP56 environmental conditions. This model is ideal for indoor or outdoor applications. Model VT56 is a lightweight, corrosion resistant position transmitter manufactured from high impact resistant plastic. With brass insert for all threaded connections for greater thread strength. The posICIon+ is also equipped with 300 series stainless steel drive shaft and fasteners. With captive cover screws there is no chance of dropping and loosing fasteners during commissioning of your project. The dome style visual position indicator provides local position indication at a glance. To set ICI’s posICIon+ position transmitters limit switches simply operate the actuator to the open position, push the top cam down and rotate to the desired position then operate the actuator to the close position pull the lower cam up and rotate to the desired position. The interlocking, spring loaded cams assure accuracy, repeatable and reliable position indication.